To apply makeup is one of the most favorite part of every woman's beauty routine! We all love experimenting with fun colors and trying out the latest trends and makeup tutorial videos. I’ve made my fair share of mistakes with makeup, thinking that it looks good when I’m in front of my bathroom mirror only to realize that the colors aren’t what I expected when I take a look in the mirror at work. There had to be some way to make sure that my makeup looked as good in natural light and at work as what I saw in my mirror at home. Thankfully, a best lighted makeup mirror has helped to solve this problem! Using a lighted makeup mirror helps makeup junkies and newbies alike to illuminate the face and ensure that the makeup seen in the mirror, is how it will look all day. I used to think it was impossible to get the same looks as the women in the makeup videos. But since using a lighted makeup mirror, I can experiment with any makeup trend with more confidence! 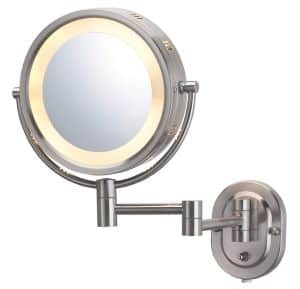 The Conair Oval mirror is large enough to fit in your entire face, and it features a soft halo light by an incandescent bulb around the oval, illuminating your whole face at once. I like how this design allows you to focus on your face without anything else getting in the mirror’s frame. It’s easy to focus on specific areas using this mirror. You can flip the mirror around to use a 1x magnification side for your whole face or a 7x magnification side. The 7x magnification side is perfect for creating wing-tip eyeliner, tweezing brows, putting on lip liner, and even more! It comes in three finishes to match your style. Chrome finish, oiled bronzed finish and satin nickel finish. It is fog free as well which makes it a good choice to use in your bathroom. This mirror plugs into the wall to turn on the light. Because of its small base, you can set it on your counter, even if your counter space has room for barely anything more than a sink. Apartment-dwellers can be thankful for a mirror that won’t take up much precious space! 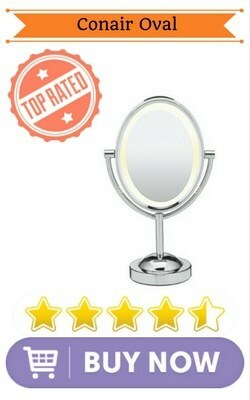 This is one of the best rated lighted makeup mirrors and quite affordable too! The energy efficient daylight LED’s that encircle this mirror mimic the sun’s glow. The light is more diffused than some of the brighter models on the market. There are 16 LED's to give you natural daylight effect to give the most natural reflection. The 10x magnification of the Fancii will be fine for most people using the mirror to apply makeup, and quite handy if you have a lot of acne or discoloration that you want to see closer. The 5.2 inch clear glass square mirror has an advanced suction mechanism. It also has an easy-lock suction feature at its base, so you can either set it on your counter, or you can stick the suction cup directly to your regular bathroom mirror and swivel the mirror in any direction. The suction can be easily unlocked with a simple twist. It also allows 360° rotation so that you easily can set it any desired angle. It takes 3 AA batteries instead of needing to charge, so you won’t have to worry about any tangled-up cords. This mirror is great for people who travel or people who live in small spaces. 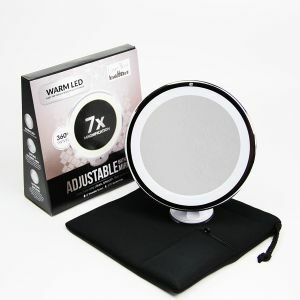 It comes with a soft velvet pouch making it perfect for travel and is one of the best lighted magnifying makeup mirror. The Miusco mirror is round, with two sides so that you can either view your face in 1x magnification or 7x magnification for precise detail. It can be powered two ways: by 4 AA batteries or by charging with an adapter. The light is diffused more than natural light, so this is a mirror that will work for most people, but will not provide enough light for professional makeup artists. Light is cooler and will work best for people with cooler-toned skin. This mirror comes with a dial to adjust the light’s intensity, so you can also tone it down as needed. This is a wonderful mirror for travelers because it is thinner than most mirrors and light enough to be held in one hand while applying makeup with the other hand. The ability to use batteries to power it also makes it easy to take outside the bathroom. At just over six inches in diameter, this mirror is also small enough to pack in your bag. The rectangle-shaped Jerdon Tri-Fold mirror fits on your counter-top and unfolds to show three mirrors, perfect for looking at your face from a variety of angles. This is especially awesome if you are looking to brush up on your contouring or detailing skills, since you will have a panoramic view of your face! It has two lights, one of each side of the middle mirror, which provide a great amount of light straight on your face, but it does not have lights on the sides of the left and right fold-out mirrors. These mirrors will work well for most people, but if you are doing professional-level makeup, you may want more lighting. The best part of this mirror is that its lights can be changed to fit different environments. You can set them to “day,” “office,” “evening,” or “home” lighting, which means that you can see exactly how your makeup will look in the lighting where you will be wearing it. No more makeup mistakes going from your home to the office or the bar! As a plus, you can zoom in to use 5x magnification, allowing you to use the mirror to see even the tiniest pores. Just plug it in and you are ready to use it! The Simplehuman sensor mirror feels just like a friend helping you with your makeup! Its sensor will track when you walk by and light up the mirror as soon as it detects your face. It also raises and lowers to adjust to your height, and the mirror pivots around the stem to provide the best angles for you.It uses long lasting surgical grade LED's that generates bright natural sunlight equivalent light. You can purchase a countertop version, which charges using a USB cord, or you can purchase a version that mounts on your wall. Wall-mounted mirrors can either be hardwired into the wall, or they can be set up to be taken down to charge. For most people’s use, the rechargeable battery will last for more than a month at a time, allowing you to take the mirror with you on travels or use it outside the bathroom. It also turns off automatically once you are away from the mirror! The mirror’s light circles around the entire mirror and simulates sunlight. The distortion free 5x magnification mirror with aluminium coated backside is excellent for seeing in fine details ! This is the only light setting on the mirror, so if you use this mirror, you may miss the option to use a lower light setting to prepare for darker environments if you are commonly using lighted mirrors for night makeup. See the video below to see how it works. The one drawback to this mirror is that it costs around $200, while most other lighted mirrors cost less than $100. If you have the money, though, the elegantly designed sensor mirror with near natural light can certainly be worth the price! Lighted mirrors allow you to see more detail than regular mirrors, which might not be detailed enough to show discoloration. 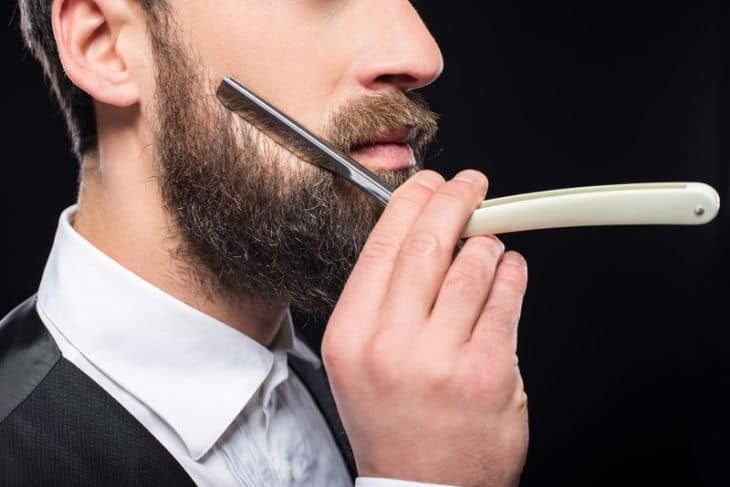 Most people who buy lighted mirrors are women looking to use them for makeup application, but many men have also bought them to assist with getting a close shave. Fixed Stand– These mirrors come with a fixed solid stand that can be placed on a flat surface like a dressing table. You can usually adjust the mirror angle while the stand remains stationery. Swivel Stand- Some stands can swivel up to 360° so that you can get desired angle by twisting the stand itself. Usually they will use suction based stands that can be fitted on any flat surface including your big bathroom mirror. Wall mount– These are permanently mounted on a wall to take up less space near your bathroom mirror or dresser. They can be kept folded when not in use. Travel– These are compact portable mirrors that use batteries so that you can take them along while travelling. They are usually fold-able and light in weight. Magnification - First, mirrors can come with one or multiple levels of magnification. The standard magnifications are 5x, 7x and 10x. You may want a mirror that magnifies many times so you can see deeply into your pores, or you may want a mirror that allows you to flip back and forth between viewing your whole face and zooming in. Lighting-Second, you need to consider what kind of light you want. There are warm lights and cool lights, and they each work best for different skin tones and environments. The mirrors feature LED lights, fluorescent bulbs or incandescent bulbs to mimic natural sunlight for getting near natural reflection. LED lights emit light using diodes and are more preferred nowadays due to their long life, less heating and less power consumption. Fluorescent lamps makes use of gas filled bulbs to produce light but have lesser life than LED's and more power consumption. Incandescent lamps are the oldest type that make use of filament heating to produce light. Though cheaper they are hotter, less lasting and more power consuming than the other types. Also look for different light settings to see how your face looks in low lighting. Power-Third, you will need to consider the power source for your mirror. If you want to be mobile or travel while doing your makeup, you may prefer a mirror powered by batteries. However, if you will mostly be using a mirror in your bathroom and want more power to brighten the lights, you may prefer using one that plugs into the wall. 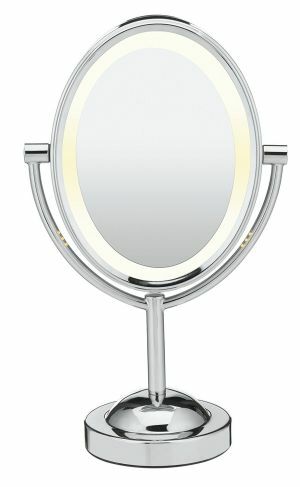 For its price, the Conair Oval Double-Sided mirror is the best lighted makeup mirror. Its oval shape is large enough to fit your entire face, and it allows options for magnification and for light intensity. 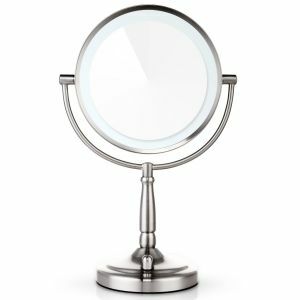 Also, the 7x magnification is enough to let people view and reach their pores and even small acne or discoloration marks.There may be more expensive lighted mirrors out there, but this one can satisfy your needs for under $100! Check out our reviews of the best blow dryers ﻿here. 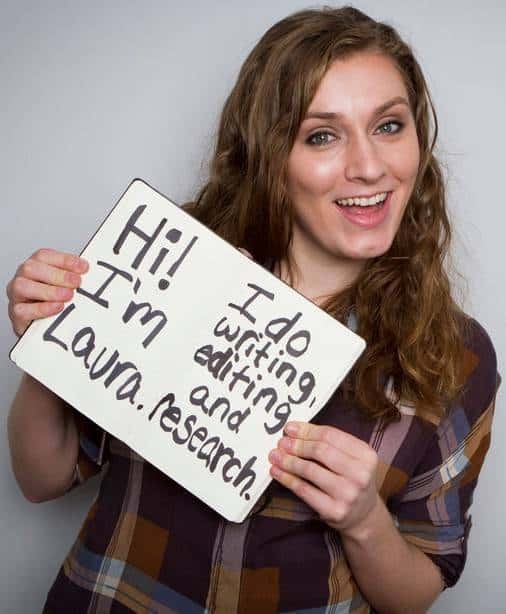 Very good choices Laura, great writing style as well. I really like the formatting of the text itself too, well done! I am actually doing research for a gift here. My wife had wanted a lighted mirror since her’s broke when we moved into our house in the Spring. I have not been able to find the one she had since it was a very old mirror her mother gave her. This has been a huge help. I am actually able to see the pros and cons and decide which would be most like the mirror she loved. I am getting it for her for Christmas as a “surprise gift” she won’t be expecting.